MAJE coat. CÉLINE sunglasses. ANTON HEUNIS earrings (here). ZARA sweater. ZARA pants. 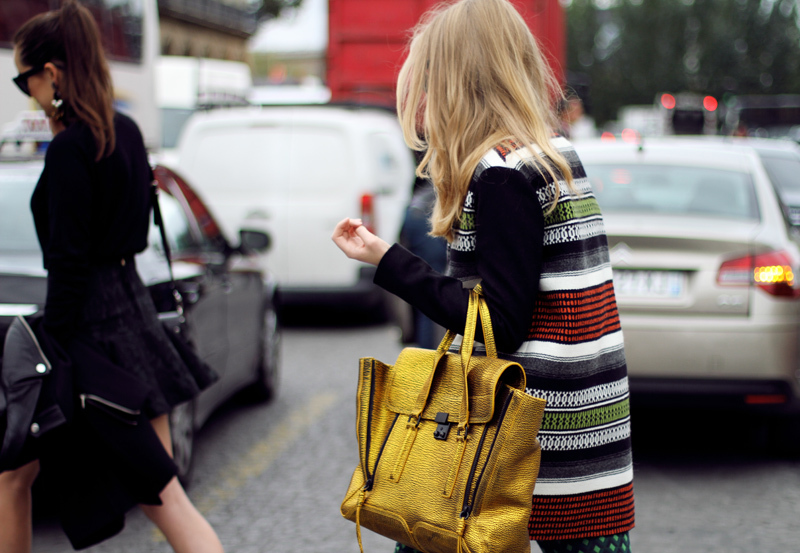 3.1 PHILLIP LIM gold pashli satchel (here). CARVELA attack black pumps. This entry was posted in Fashion Week, Outfit and tagged Andy Torres, anton heunis, Louis Vuitton, Maje, Paris, photo diary, ss13 by Carolina Engman. Bookmark the permalink. fab! New Post Up: at the H&M Showroom! A simple but bold outfit! I love that they paired girls on the runway, it gave each look more personality. love your outfit, you both look amazing. I love your bag, it´s stunning! you have always perfect heels! The bag is just unreal! this outfit is so perfect. love every item in your look. but the bag…it’s perfect! I love your look, especially the bag!!! Beautiful outfit, the photos are so great! Amazing pictures! Girls, you both look great! stunning look , amazing pics! Great photos and looove your jacket! I am maddly in love with this gold purse. AND THE MIX OF PATTERNS looks outstanding. My favourite city. Love the mix and match prints! wow, how can you possibly run in those shoes, I salute you! you guys look lovely as always!! Love your matching sunnies. 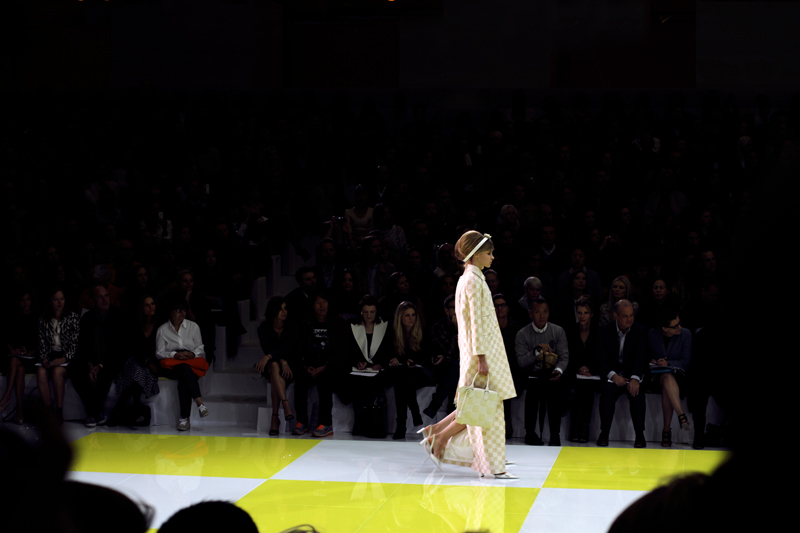 The LV show was amazing – so original. It was a magical show indeed!! Love the coat you wear!! Wow that show was stunning! I love the uber short black mini dresses with the old school madmen hair. And YOUR BAG metallic chartreuse! Does it get any better then that! Did you know it was going to be on theme with the show or was that just a happy accident. I would love those earrings! 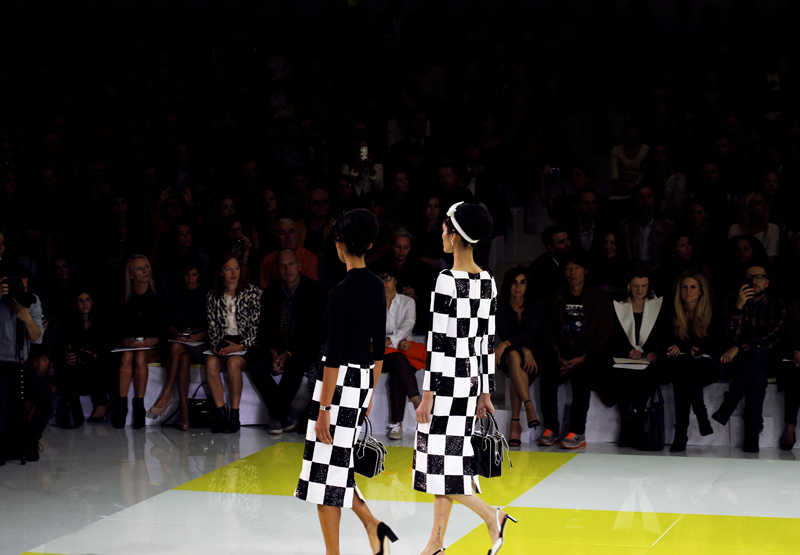 loved the lv show, leave it to marc to always do something innovative. and you ladies deserve some major kudos for sprinting in those heels! 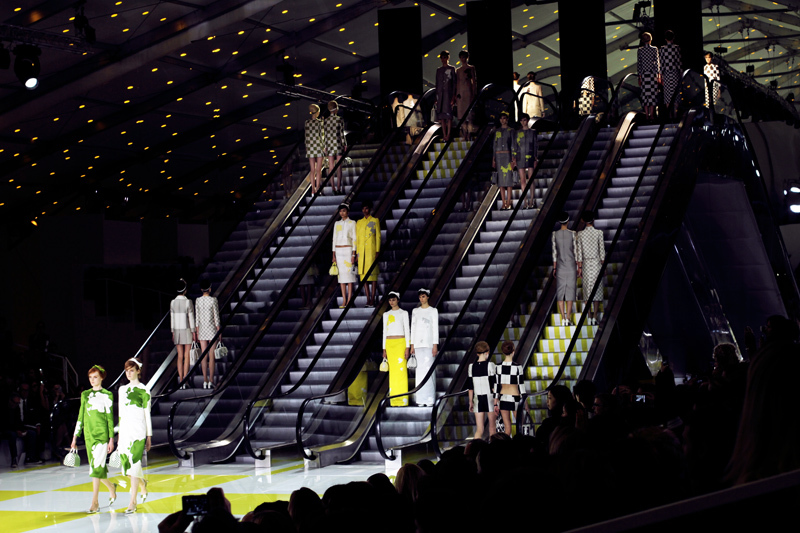 wow, that show looks fabulous, especially the set/structure: awesome escalators! What an amazing yellow bag. Love it. Love the pictures! Just signed my blog up to bloglovin’ and so impressed by your blog!! You guys’ sunnies are amazeballs! Prada makes a similar pair & I can’t wait to get them. Are the Celines polarized?! that outfit is just amazing. and the bag is just too hot to handle! 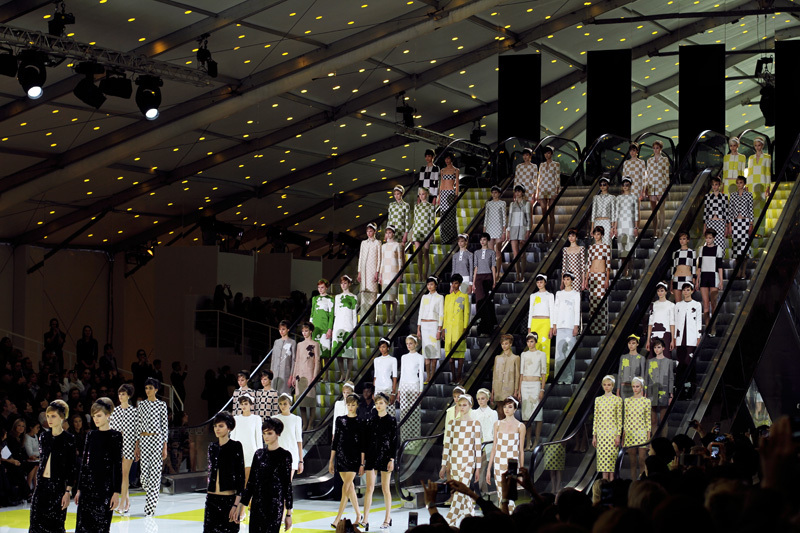 the LV show looks very creative and inspiring! I always love your blog. I visit your blog everyday. And that was really amazing. LOVE your jacket!! 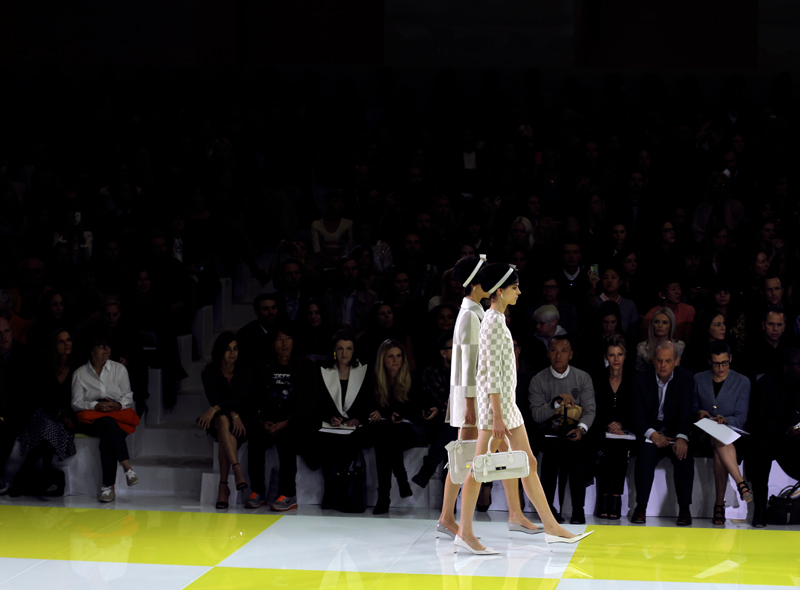 …and the Louis Vuitton show looked fantastic! What a way to have to get to the show,in those beautiful heels too! That gold bag is so great,Loving the tin foil style look.You matched the prints really well too,Great outfit. I’ve been looking for a pair of pants like your for, why, a year! Love the combination of the pants and the coat! Works really well together! I really love the combination of your coat and those pants. Amazing! I’m totally into mixing patterns at the moment so how can’t I love this?! And this bag makes it even better. Awesome outfit!!! And how fab was the show! Great pictures first of all !!! Second I love the coat !! Your bag is gorgeous. Not seen a blogger wearing this colour. And such an amazing show to be at. i love it that you’re always up to the challenge to diversify your looks. looking awesome! The decor of the show is so impressive ! you , girls , look amazing ! Stunning outfit! Love those pants! You are so lucky that you were invited to the show! You two look absolutely stunning! Your polka dot pants are just amazing paired with your aztec print coat and gold bag. The print mixing is so unexpected, girly polka dots with hard hitting tribal print, but that’s what makes it so great! i just adore the earrings, the’re so stylish! You are gorgeous! Funny fact, I was wearing the same pants and coat together just a few weeks ago! love the combination. Awesome outfit! I love the pics and the show! Beautiful outfit yet an amazing show! Your bag is so gorgeous. You look like a model yourself. 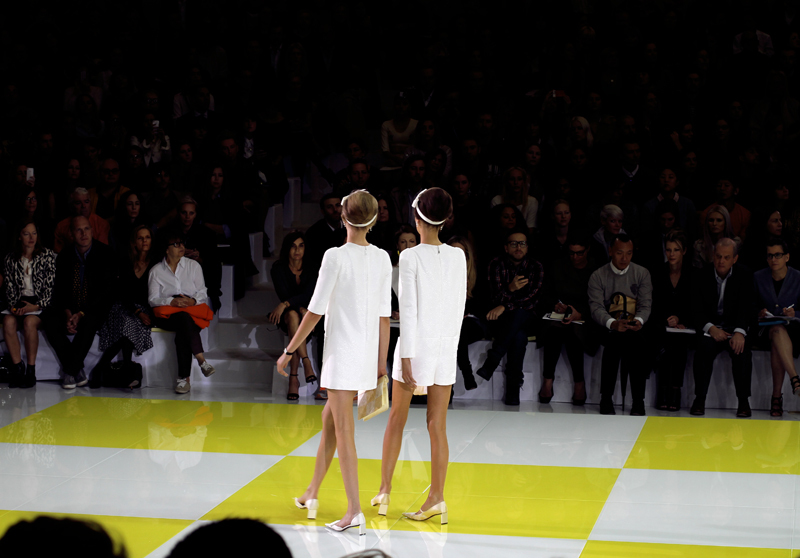 Also, I find the new collection of LV kind of cool and the way they presented it! Can’t get enough of the 3.1 Philip Lim!!! The Gold is so stunning on you! That gold pashli is simply amazing! the gold color of your bag is amazing!! 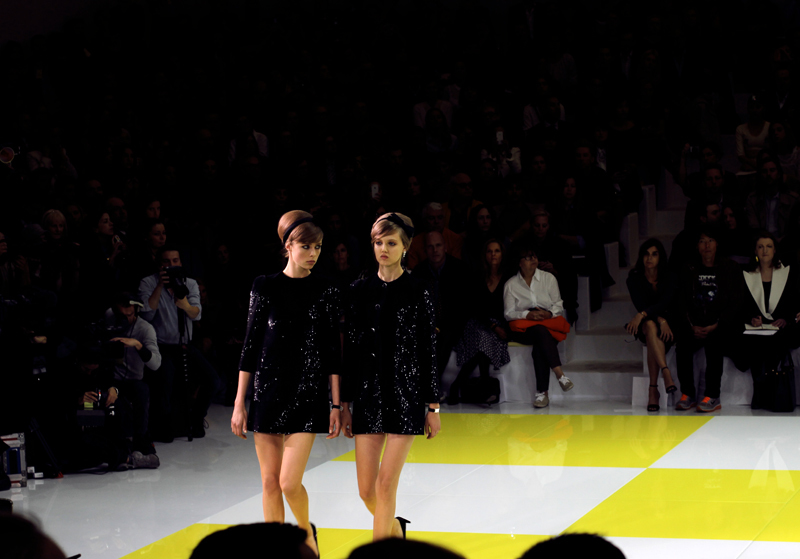 I simply adore the 60’s direction the the Vuitton collection took! 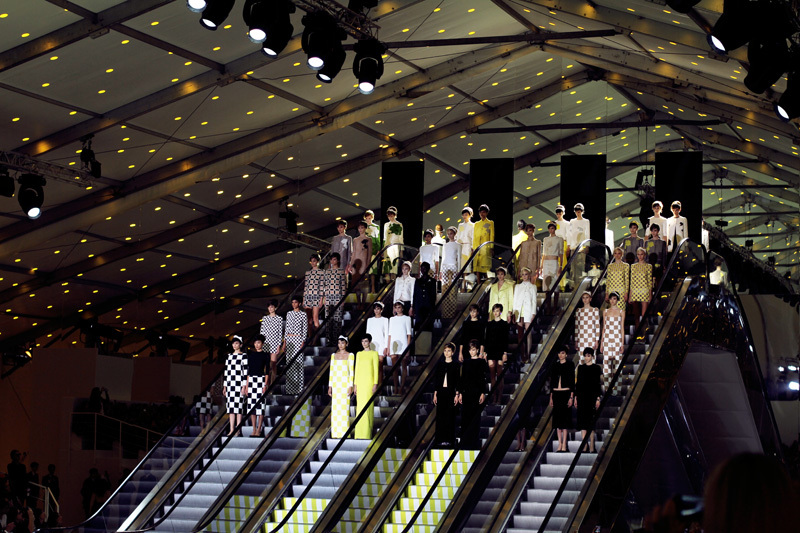 Loved the runway shoe, the little yellow dots on the ceiling were very cool! 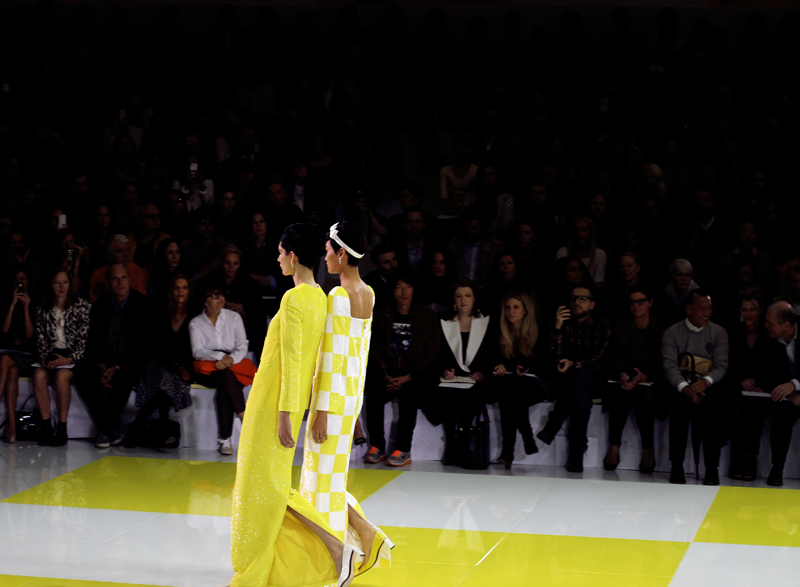 You and your friend looked gorgeous and like you really belong on the runway! I can’t wait ’til I go to Pairs myself, which is January 3:rd! So excited! wow sounds hectic but fun! I just fall in love over and over again with your sunnies!!! And besides, the show was amazing!! Sounds like you had great time at LV. Your outfits are simply beautiful. But I just love bag, it’s such a beautiful piece. Your ear accessory also is very very attractive and gorgeous. That must have been one great show! Not to miss, you look absolutely stunning!